D’où vient nostre destin de la Parque ordonné ? Destournez (s’il vous plaist) mon malheureux presage. J’ay senty tout mon cœur bouillonner d’une rage. Pour victime eternelle au frere du sommeil. Where does our destiny, ordained by Fate, come from? Turn aside – please! – my unhappy future. Infect my whole heart boiling with anger. As eternal victims for sleep’s brother. Ronsard as always is very precise in his mythology: “sleep’s brother” is clearly Death (Thanatos), who is indeed the brother of Hypnos, god of sleep. Nowadays we’re more likely to think of Morpheus, but he was god of dreams not sleep, and the son of Hypnos. Sans plus les réveiller, au dormir de la mort. No more to wake, with the sleep of death. Jeune et si fol, et de malheur si plein ? De la rigueur d’un trop rigoureux maistre ? Pour mon malheur noircit mon fil humain ? En lieu de laict, de soin me fit repaistre ? Heureux les corps dont la terre a les os ! Presse au giron de sa masse brutale ! Pour trop sentir, qu’un Sisyphe ou Tantale ? Young and so foolish, and so full of misfortune? Of the harshness of a too-strict master? Blackened the thread of my life to my misfortune? Fed me with hard care in place of milk? Fortunate those corpses whose bones are in the earth! Presses to the bosom of his rough form! From having too much feeling, but Sisyphus or Tantalus? Another sonnet with which the older Ronsard tinkered; I have for instance translated line 7 above to follow line 5 (‘Which of the …’) even though that feels a little awkward in line 7, only because in the earlier version (below) Ronsard does not deliberately parallel the beginning of the lines! (Interesting that he removes the insistent duplication of “Heureux ceux-là” in lines 9-10, but adds the less insistent duplication of lines 7 & 9.) The Sisters are a well-defined group – the three Graiai whom Perseus visits, sometimes identified with the Moirai or Fates who spin the threads of man’s life; ‘the Demons’ are a far less clearly-defined group – ‘which demon’ (in Blanchmain’s version) carries that sense of a less-defined group better. In other respects the change in the second stanza seems clearly (to me) to move away from the easy writing of the early version towards a more tortured, deliberately complex and obscure style – Ronsard (again) trying too hard in his old age to eliminate elements of youthful simplicity from his poems? Sisyphus and Tantalus in the final line are famous images of the torments of Hell – Sisyphus always rolling his great rock uphill but never reaching the top, Tantalus always ‘tantalised’ by food and water just out of reach. Et de misére et de tourment si plein ? Noircit le fil de mon sort inhumain ? 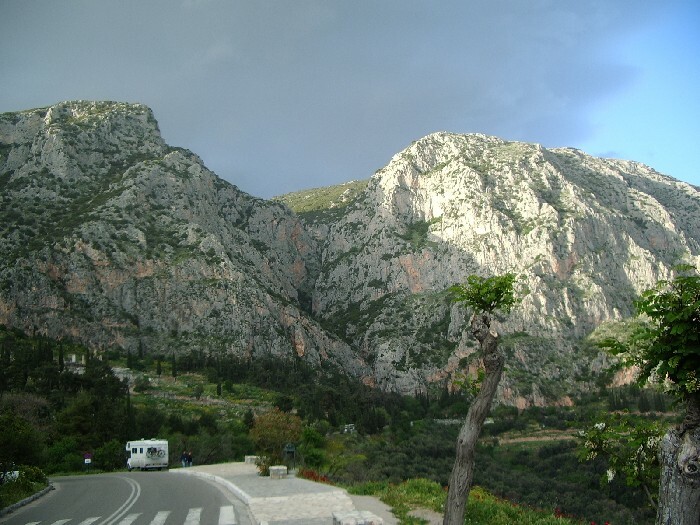 Berça mon corps quand le ciel me fit naistre ? Heureux ceux-là dont la terre a les os ! So full of sorrow and pain? Blackened the thread of my inhuman fate? Cradled my limbs when heaven had me born? Fortunate those whose bones are in the earth! Because I like it – and because it starts with a ‘G’ 🙂 – here is a « fragment que Ronsard n’a peu achever, prevenu de mort. » (a fragment Ronsard was unable to finish, overtaken by death). Qui serre de si prés mon cœur avec le tien. Tout le parfait requis aux plus parfaits amis. Which binds my heart so closely with yours. Everything perfect required in the most perfect friends. 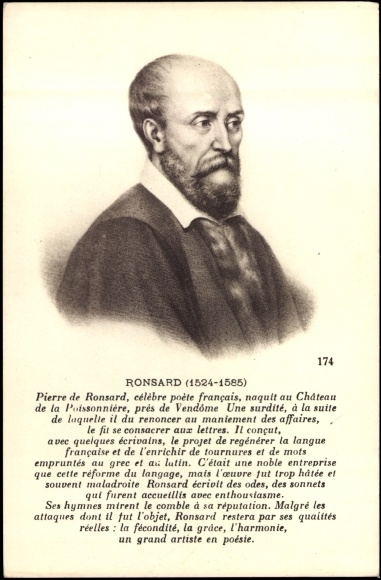 Ronsard’s trusted friend Jean Galland was principal of the Collège de Boncourt in Paris, and after Ronsard’s death both organised an annual commemoration of the poet in the chapel there, and (together with Claude Binet) edited Ronsard’s late verse and put together the ‘Tombeau de Ronsard’, a (substantial) collection of poems in Ronsard’s honour. The Collège had other links with Ronsard’s circle: tragedies by Jodelle were performed there, and Muret taught Jodelle and Belleau there. In 1688 it was Pierre Galand, then principal, who merged the Collège with the Collège de Navarre. This fragment is (obviously) very classicising, and stuffed with antique references. The Atrebates were a tribe from the Pas-de-Calais area, who established an offshoot in southern England after Caesar’s conquest. The centre of the region is now Artois, its capital Arras, from which the river (now the Scarpe) heads east towards the Rhine and the border between Gaul and Germania. Elis was a state in the south of ancient Greece: within it was Olympus, seat of the Olympic Games – so running on Elean sands is running in the Olympics. A minor editorial note: Blanchemain has “Pour estre separés de villes et d’espaces” in line 9. The text above in effect says ‘though I am separated from you…’, while Blanchemain’s plural says ‘though we are separated…’ – I leave you to choose which you prefer. This is my 200th post (though not yet the 200th poem), so I wanted to do something special. In the end it has snowballed a bit and this post is going to be monstrously long…!! Hope you enjoy it anyway. Et que tous deux avoient un mesme cœur commun. Riche d’or et de gens, de villes et de terre. Traversa la Hongroie et la basse Allemaigne. Qui pour lors avoit guerre encontre les Anglois. Par qui premier je vy ceste belle lumiere. Luy soit autant loyal qu’en la felicité ? Une rue à son los porte le nom de luy. Et de l’an et du jour de ma nativité. Tout aussi tost que né, de la Parque ravy. Semblable je ne suis ny de mœurs ny de bien. Puis sans rien profiter du college sailly. Où trente mois je fus, et six en Angleterre. Poussée aux bords Anglois la nef contre un rocher. Et qui servoit flottant aux ondes de jouet. En la haute Allemaigne, où la langue j’apprins. Qu’encores aujourd’huy j’en reste demy-sourd. N’effacera ce nom du marbre de mon cœur. De nostre amy Baïf sera perpetuelle. The two joined by one shared heart. Rich in gold and retainers, in towns and lands. Who for some time had been at war with the English. Through whom I first saw this fair light. Be as loyal to him as in good? In his honour a street bears his name. Date, both the year and the day, of my birth. As soon as born, torn away by Fate. In no way similar in either way of life or wealth. To learn the lessons of the master, de Vailly. Then I left having gained nothing from college. Where I spent 30 months, and six in England. Onto the rocks, after blowing it to the coast of England. Which used it as a plaything as it floated on the waves. To Upper Germany, where I learned the language. That still today I remain half-deaf as a result. As I followed the Court to Blois, through the fair eyes of Cassandre. Wipe that name from the marble [memorial] in my heart. For our friend Baïf, be everlasting. Traversa la Hongrie et la basse Allemaigne. Poussée aux bords Anglois ma nef contre un rocher. N’ostera ce beau nom du marbre de mon cœur. Remove that fair name from the marble [memorial] in my heart. This ancestor of our poet, who came from the lower Danube to offer his services to Philip of Valois, was called Marucini or Mârâcinâ like his father, who added to his name the title of Bano (Ban). Once settled in France he translated his paternal name and title literally, changing ‘bano’ into Marquis and Marucini (=Ronces – bramble; or Roncière – bramble-bush) into Ronsard. Source: Ubicini 1855, Romanian Popular Songs collected by Alecsandri [see further the notes below about Alecsandri’s contribution on this origins story]. Henry = Henry II, then Duke of Orleans. It was a great thing at that time to be in charge of the king’s household; for his responsibilities were given only to noble folk and there were no valets [grooms] who were not gentlemen. King Francis I, who was captured before Pavia covered in dust and blood, returned to France [in exchange for] leaving his two sons, Francis the dauphin & Henry Duke of Orleans (later king) as hostages in Spain. Trimouille: the princess, mother of the Prince of Condé, bore this name. Bouchage: of the house of Joyeuse, father of madame de Guise, mother of mlle. De Montpensier. Rouaux: from which came that great warrior Joachim Roüaut [Rouault], marshal of France under Charles VII [actually, under Louis XI in 1461 rather than under Charles; Jeanne Chaudrier, Ronsard’s mother, was a descendant]. Chaudriers: an ancient house [going back to the Mayor of la Rochelle c1300; Ronsard’s mother was also Dame du Bouchaige]. The maid carrying him when they were taking him to baptism dropped him on a meadow, specified as the pré Bouju by Cohen(!). Descended from the eldest brother and still alive in 1623, his grandsons, were de la Poissonière & the knight Ronsard, and several girls descended from one or the other of the children. He studied at the college in Navarre under a man called de Vailly, beneath whom also studied the Cardinal of Lorraine [a member of the influential Guise family]. Charles = Charles V, [Holy Roman] Emperor and King of Spain, who attacked Provence and who boasted he’d hold Paris like Madrid. Orleans = Henry II, being Dauphin on the death of his brother, poisoned at Tournon by the Count of Montecuculo [Count Sebastiano de Montecuccoli, secretary to the Dauphin, was executed for his murder though it is likely the Dauphin died of tuberculosis]. Ronsard made the journey to Scotland in 1536, in the entourage of James V who had just married Madeleine, daughter of Francis I, in Paris. That king married secondly [Mary of Guise] the sister of M de Guise, Francis of Lorraine; from whence comes the blood-relationship between the Guise family & the king of England. Flanders: the Duke of Orleans sent Ronsard, who was his page, to Flanders and Zeeland, with several letters of credit that he sent to his mistress, niece of the Emperor. This was Lazare Baïf, a gentleman of Anjou, related to those [gentlemen] de Laval [an important family, producing several marshals of France in mid-1400s] and de Guimené; the king’s ambassador in Germany as he had been in Venice; a very learned man, witness the books he wrote De re navali [About naval matters] and De re vestiaria [Concerning clothes]. He was father of Jean Antoine Baïf, excellent poet. Loys de Ronsard served Louis XII with distinction in the Italian wars between 1495 and 1515 – being present at the taking of Milan in 1499 and Genoa in 1507, the capture of Ludovico Sforza in 1500, and the battles of Agnadello (1509) and Marignano (1515). After the King’s death Loys became maître-d’hotel and then premier maître-d’hotel to King Francis I and remained in France, but following the disastrous battle of Pavia when the King was captured he spent the years 1526-30 in Spain with the hostages who had been swapped for the King’s freedom after Pavia: the dauphin Francis and his younger brother Henry, later Henry II. He brought back a fair bit of Renaissance sculpture from Italy to adorn his home (the Château de la Poissonière, near Vendôme, where his son Pierre was later born), among the earlier Frenchmen to appreciate the new art burgeoning in Italy. Ronsard’s birthdate is a cause of endless confusion, argument and uncertainty. It amuses me that the biography on Wikipedia.fr states three different dates in three different places… We know where he was born (the Château de la Poissonière, near Vendôme), but not quite when. Ronsard says here he was born on Saturday 11th September 1524. However, the 11th September was in fact a Sunday in 1524. (And, because 1524 was a leap year, it was a Friday the year before; and thus 11th September was never a Saturday in the 1520s!) Other dates suggested therefore include Saturday 10th; as well as Friday 2nd or even late at night on Saturday 10th as it was just turning into Sunday(!). Perhaps from a mis-reading of the poem, a tradition grew up that he was born on the date of the Battle of Pavia, 25th February 1525, as well. [Note: this is still ‘in the same year’ as his birth because new year was at the beginning of March at this time.] The 2nd September 1525, and even 6th September 1522 – both of which are Saturdays – have also been suggested. The fact is, we will never know: but a date in early September 1524 seems likeliest. We know that Ronsard had a sister and two brothers: Louise (b. 1514), Claude (b. 1515) and Charles (b. 1519) who entered the church. He was the last born – and (as he says here) a ‘long time’, five years, after the other children. However, Chalandon writing in 1875 mentions also a fifth surviving child, another Loys, who became abbé at Tyron; I haven’t been able to track down anything more about this claim, which seems an extraordinary one – would Ronsard have forgotten or attempted to erase the existence of one of his brothers? Ronsard went to the Collège de Navarre (part of the university of Paris) in the autumn of 1533, perhaps in preparation for a career in the Catholic church to which, as a younger son, his father may have destined him. He left quickly, though it is not clear why: perhaps because the teaching was bad, more probably because he didn’t like the idea of a church career and wanted to see some excitement with the Court and the army. Simonin’s 1990 biography also suggests he left college (or perhaps was removed by his family?) because of agitation there by the Protestant reformer Gérard Roussel. This was of course a period of immense tensions in France, as in the rest of Europe, between the established church and protestant reformers. While he was there, though, Ronsard apparently made the acquaintance of Charles de Guise, later Cardinal of Lorraine, and as a Guise a member of a powerful and influential family. Another, Mary of Guise, later married James V of Scotland and precipitated Ronsard’s return to France. It is interesting to note that one of the great theologians of the time, Mathurin Cordier, had been master at the college a few years earlier, though he had moved on to another college by this time. Ronsard was appointed a page at Court in 1536, initially to the Dauphin but when he died soon afterwards he joined (as he says) the suite of Charles, Duke of Orleans. When the King’s daughter, Madeleine (sister of Charles) was married to King James V of Scotland in January 1537, Ronsard was given to Madeleine by Charles and went to Scotland in her service. She died in June the same year, and was thus known as the ‘Summer Queen’ by the Scots. The boy Ronsard was then attached to the Court of King James. There is little corroborating detail for Ronsard’s claim to have spent 3 years abroad; some doubt the whole story. But it seems probable that he stayed in Scotland until 1538, when the king re-married; and thus it seems likely (to me at least) that his 3 years in England and Scotland includes time later when he travelled in the suite of Lassigny (below). It’s not clear why he spent 6 months in England; but there are later links with the Renaissance court there and it is possible the precocious teenage Ronsard was extending his knowledge of humanist poetry and poetic forms at Henry VIII’s court? Cohen doubts that Ronsard bothered to learn German; it wasn’t a very useful language at the time! Struck by illness (Cohen postulates a possible venereal origin! ), Ronsard retired to Poissonière for a lengthy recovery. Half-deaf he decided to abandon a politico-military career and turned again to study, perhaps with a view to some sort of church career. He in fact took the tonsure in 1543; this did not make him a priest but it did make him eligible for a number of church posts from which he could have drawn (and later did draw) income. In the event, though, he remained in the service of Charles of Orleans and attached to the Court. So when did Ronsard move to Paris? Immediately after what? (Or perhaps the later change to the text means it wasn’t ‘immediately after’?) Ronsard’s parents both died in 1544, and Lazare de Baïf apparently stepped in to offer the young man the chance to study in Paris, with the younger Baïf under Jean Dorat (D’Aurat). Initially the pair lived at the Baïf residence, as did Dorat who had been engaged to tutor Jean-Antoine; but Lazare died in 1547, and it is likely that at this point Dorat installed himself at the Collège de Coqueret where he became principal around this time. The ‘five years’ spent under Dorat would therefore include those initial years when they studied privately with him. Although after Lazare de Baïf’s death Ronsard and the younger Baïf moved out and apparently joined Dorat, it is not clear that they attended his Collège. That is hardly “chez luy”. Indeed Ronsard entered into a contract to rent no.2, rue de la Poterie, at Easter 1548 jointly with a minor cleric – interesting evidence also of a continued involvement in ecclesiastical circles. Baïf and Ronsard were joined under Dorat’s tutelage by Belleau, and then by du Bellay, at this time – the core of the Pléiade. At least one source refers to the Pléiade arising from ‘teaching/learning [enseignement] at Chef Saint-Jean’ – Dorat’s own home. Perhaps then the group met informally at Dorat’s house rather than formally at the Collège. And it was from this context that du Bellay launched the Pléiade’s “manifesto” Défense et illustration de la langue française in 1549 and Ronsard exploded the bombshell of his first major collection, the Odes I-IV, in 1550. 3 – a Romanian (or Bulgarian) ancestor? Did Mârâcinâ Ban exist, and was he Ronsard’s ancestor? The probable answer is no: this was quite possibly a family tradition which Ronsard reports – though it has also been suggested it might be pure imagination on his part! The romantic tradition of Ronsard’s Romanian origins was not just popular in France. A French teacher and activist working in Romania during the 1830s -40s, Jean Vaillant, adopted Ronsard’s story in his 1844 book La Roumanie, using him as a symbol of the links between France and Romania. Then the Romanian poet Vasile Alecsandri, writing in Paris after the failure of the 1848 Wallachian revolution, produced Banul Mărăcină in 1855 (though it was not published till 1861). This developed the bare bones of Ronsard’s story with circumstantial detail: Alecsandri made Mărăcină a boyar, lord of Ronsart, governor of Craiova (70 miles west of Bucharest, now Romania’s 6th largest city); and specified a troop of 50 younger sons coming to liberate France. It interests me that Blanchemain used Alecsandri’s “research” (indirectly) as a source for his footnote providing the story. But romantic legends are not facts. Further scholarly activity in France established that Ronsard’s grandfather was Olivier Ronsart or Roussart, who was an enfeoffed sergeant (sergent fieffé) in Gastine forest. Though some have said this title is, in modern terms, a gamekeeper it is worth noting that Loys de Ronsard carried the same title; I think it would therefore be better to see him as ‘warden of the forest’ or equivalent, a minor noble rather than a mere gamekeeper. He was a vassal of the Du Bellay family, ancestors of Joachim du Bellay. Minor gentility does not of course invalidate a romantic Romanian origin, several generations further back. And scholars have identified a tradition which might be relevant: “a certain Baudoin Rossart came to France with John of Bohemia to fight the English at Crécy in 1346. King Philip of Valois apparently gave him as a sign of his recognition a domain in the Vendômois, where the brave gallant established himself.” (Alliot & Baillou 1926, in a quatercentenary volume on Ronsard) The same scholars also turned up an 11th century cartulary mentioning a ‘moulin Ronzart’ (Ronzart mill), however; which might suggest that the family had French origins several centuries older than the ‘Romanian link’. Where does this leave us? For some scholars Olivier Ronsart’s ‘humble’ title of sergent fieffé means the Romanian/Bulgarian story cannot be true; others find no reason to argue against a possible East European root for the family. For myself, I rather like the Baudoin Rossart story but am not convinced. In the end, does it matter? Ronsard came from minor noble stock; whether those minor nobles were home-grown, or came from dashing romantic Balkan stock racing across Europe in a crusade to ‘liberate France’, is really only a question of how colourful the story of his ancestry is! My source for much of the detail in this section is: N Popa La Légende des Origines Roumaines de Ronsard in Lumières de la Pléiade (9ème Stage International d’Etudes Huamnistes, Tours 1965. Special thanks to nikolchina for providing a link to http://www.patev.net/origironsard.htm which – for French readers – provides substantially more detail on the controversy over Ronsard’s Bulgarian roots, and takes a slightly less ambivalent attitude to the possibility. It also has some helpful maps!